This chapter is an exploration of the inseparable faculties of forgiveness and promise in the thought of Hannah Arendt. It focuses on the ways she demythologised certain religious practises and concepts in her political account of forgiveness and promise. 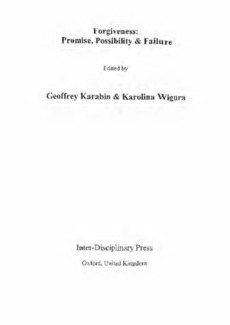 Attention is drawn to her recommendation to engage in 'the secularisation of religious tradition,' and the similarities between elements of the Jewish mystical tradition, in particular the concept of tikkun olam, and her political theory are made explicit. This study reveals that there is much more at work and at stake in forgiveness and promise than just release from the past and shared commitment to the future.